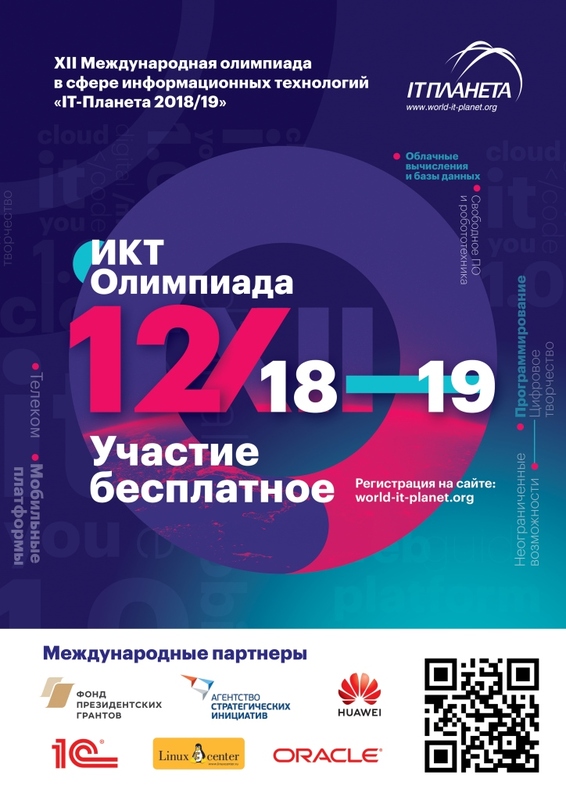 The Belarusian-Russian University has been registered for participation in the 12th International Olympiad in the field of information technologies ‘IT-Planet’ (http://world-it-planet.org/). IT-Planet is a competition aimed at identifying and supporting capable and practically trained students for the IT-sphere. Participation in competitions is a chance to demonstrate their skills in the field of information technology. In 2019 competitions will be held in the following categories: • Programming; • Cloud Computing and Databases; • Telecom; • Mobile Platforms; • Digital Creativity; • Free Software and Robotics; • Unlimited Opportunities. This year the registration period is until the end of the first qualifying stage: for students of registered educational institutions participating in technical competitions - until February 15, 2019. As part of the first qualifying stage for technical competitions, which will be held from January 20 to February 22, 2019, participants will have to take an online test to demonstrate their knowledge of the technologies relevant to the competition. Contestants with the best results will be invited to the second qualifying stage, where they will have to solve practical cases developed by representatives of ICT companies. This competition will take place from March 1 to March 20, 2019. Participants who achieve the best results will be invited to the final of the Olympiad, which will be held in June 2019 in Moscow. To participate in the competition, you have to register on the website world-it-planet.org within the period specified in the rules of each competition.